Use this guide in conjunction with a 2000 lines/mm (500nm pitch) cross line grating replica for accurate determination and calibration of TEM, SEM, AFM, and STM magnification. By measuring the distance between the lines of the replica pattern, the image magnification can be read directly from the calculator. 2000 lines/mm or 500nm grating replica specimens - our catalog numbers 673, 674 series, 677, 677-AFM, and 677-STM. 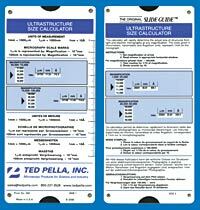 Convenient Pocket-sized slide rule calculator for quick ultrastructure measurements. Gives the actual size represented by each millimeter on a micrograph at any magnification. The magnification range is x10 to x100,000. Readings are shown in µm, nm and Å and represent each 1mm on the micrograph. English, French and German. Waterproof card, 80 x 170mm (3.15" x 6.7").